It was “love at first glance” when I spotted a cowboy caviar recipe on the web some months ago. 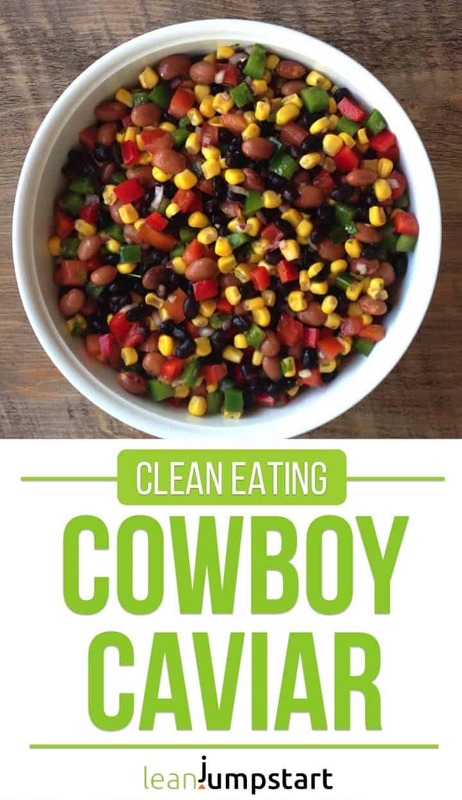 So experimenting with a clean eating cowboy caviar version was on my to-do list for quite a while. Now with New Year’s Eve around the corner, the timing could not be better for posting this healthy, really good recipe full of fiber and protein. 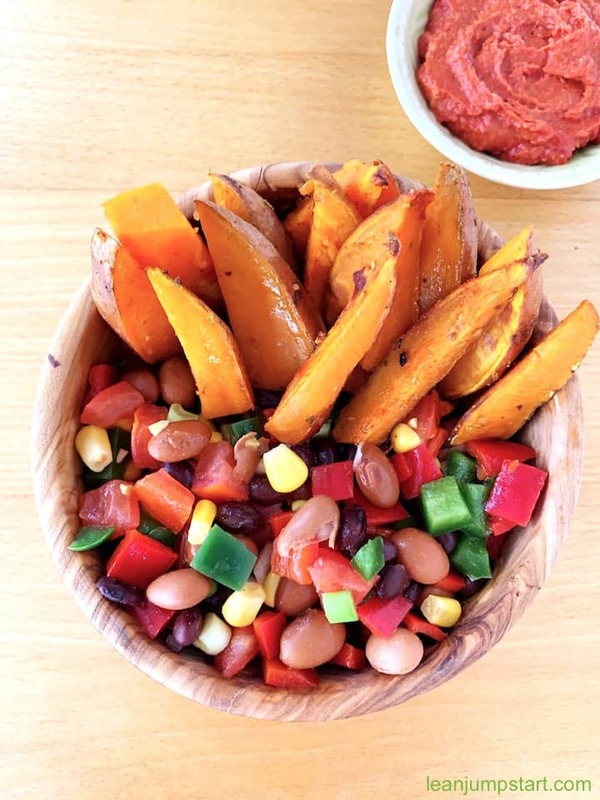 If you are living in the Midwest or South of USA then you might know this colorful bean salad crossed with veggies and salsa. And as a true expert, you can see immediately on the photo above or below that an essential ingredient is missing. I’m fully aware that authentic cowboy caviar that is also called Texas caviar, is based on black-eyed peas. But hey, living overseas here in Germany means, that you have to use the beans you can get. In consequence, I used a combination of black and pinto beans for this filling salad. Kidney beans would work probably too. Anyway if you have access to black-eyed peas, I highly recommend to include them in your legume-based, gluten-free salad. Only recently I learned that eating black-eyed peas on New Year’s day is supposed to bring good luck, wealth and happiness for the new year. The peas signify coins. And tell me, who doesn’t want to be happy? Therefore, if you are planning to serve a “Texas caviar” on your New Year’s Eve buffet, then using black-eyed peas is a must. This belief is especially popular in the south, and has probably to do with your history, right? By the way, you’ll find explanations for this tradition on Wikipedia, dating back as far as ancient Egypt. Don’t panic, I won’t bore you with history. 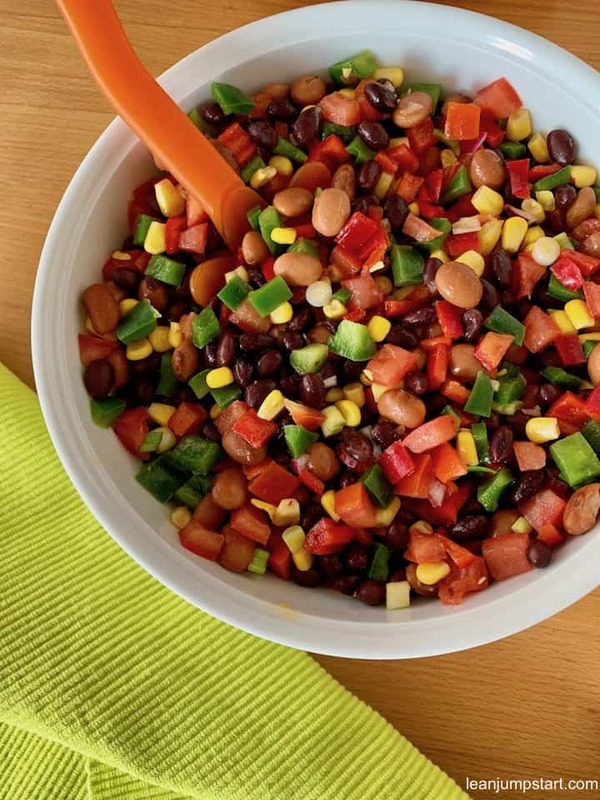 What I do know for sure is that this plant-based bean salad is a “must have recipe” for any clean eater and whole food enthusiast. 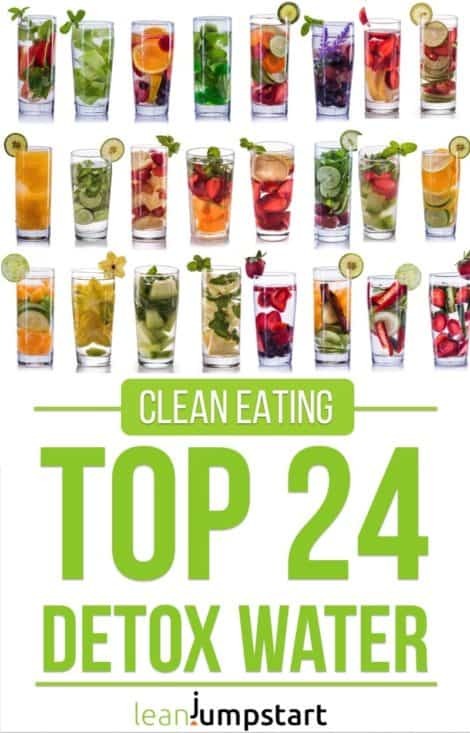 Let’s jump right into the easy salad recipe notes with all-natural ingredients which are “vegan by nature”. In a large bowl whisk together the olive oil, the red wine vinegar, chili powder and salt. 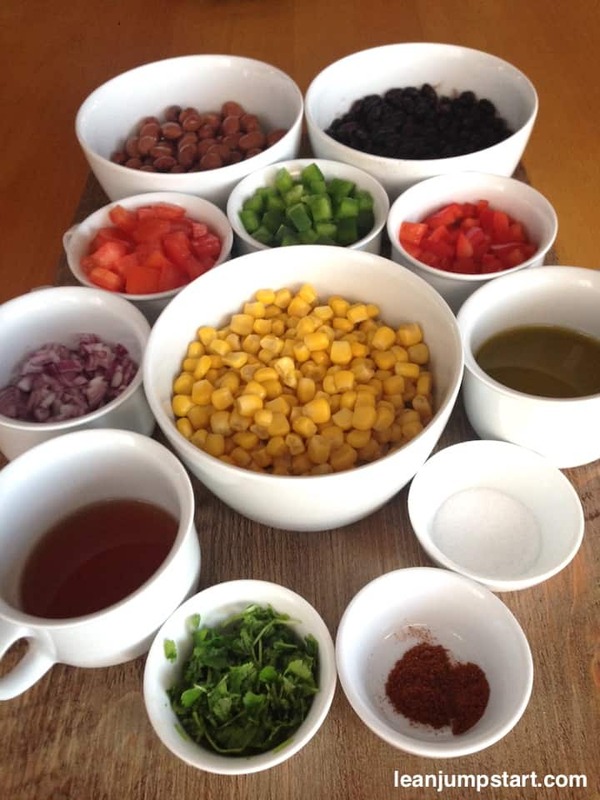 Add black-eyed peas, beans, corn, tomatoes, bell peppers and red onion to the Italian dressing. Chill in the fridge for at least 1 hour to marinate, better over night. Toss with fresh cilantro before serving. Vary ingredients according to your own taste and color preference. *Don’t throw away “bean water”. Read instead below what you can do with it. This is by the way also a great salad you can prepare in advance (e.g. the day before) and bring it with you to a party. You can store it in your fridge for up to three days. As mentioned before, in summer time it is a highlight on each barbecue. 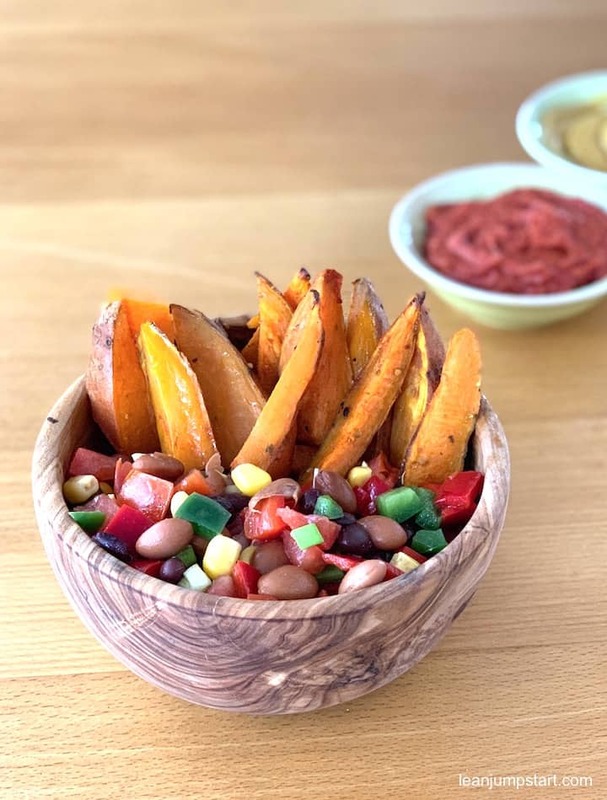 As it is a cross between fresh salsa and a bean salad, you can also serve it throughout the year as a dip with some tortilla chips or sweet potato wedges. Yes, at first glance you save time with all the convenient legumes in cans…For the best possible cowboy caviar salad, however, you have to cut the veggies in very small, regular cubes. The smaller your diced tomatoes or pepper the better. This will not only maximize your taste experience but also guarantee an attractive look and feel on any buffet. Believe me, if I can do this, you can too! You know I’m not very patient when it comes to cutting veggies into regular tiny pieces. Usually, I’d let my food processor do the job. But this plant-based salad looks only attractive (we eat with our eyes) if you cut most of the ingredients to the same small size. I know that dicing bell peppers can be a challenge, but I have a smart tip for you. Cut off the rounded bottom and top ends and save it for raw food snacking. Before I go further into detail… watch this short video from yummly, this is how I learned it. Besides happiness-boosting properties, this nutrient dense salad provides additional health benefits. Legumes release their carbohydrates only very slowly into the bloodstream and thus keep the blood sugar level constant. This will keep you satiated for a long time, which is an ideal aspect, especially for diabetics. They also contain soluble fibers that absorb cholesterol when excreted and thus lower cholesterol levels. Click through to learn more about the benefits of foods naturally high in fiber. Especially in the summertime, I love to add some small chopped avocado cubes right before eating. By the way, the content of fiber in avocado is also impressive. For the dressing, I then use lime juice instead of vinegar. If you love spicy salsa, then the addition of jalapeno peppers is a great idea. An eye-catching main dish for vegetarians is to serve the salad on greens and sprinkle it with some Feta cheese. What to do with the drained “bean water”? Did you know that you can use bean and chickpea water (Aquafaba) as a great egg white replacement for many great recipes? For recipe ideas, check out my easy chocolate mousse!